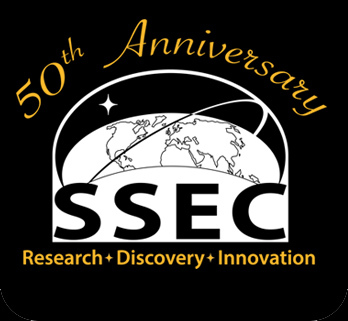 About: The University of Wisconsin-Madison Space Science and Engineering Center (SSEC) is celebrating it's 50th anniversary this year. Established in 1965 with Verner E. Suomi as its first director, SSEC has since become nationally and internationally renown for excellence in the field of satellite remote sensing. A 50th Anniversary program was observed on September 10th with numerous speakers recounting pivotal events over the first 5 decades, including the moment Vern Suomi first saw an instant-replay during a Packer football game which inspired him to animate satellite imagery and resulted in this now famous quote “the clouds moved – not the satellite”. SSEC provides a vast array of real-time imagery and data products, including numerous satellite composite images (Figure 1). Reason you participate in ESIP: SSEC participates in ESIP through it's Cooperative Institute for Meteorological Satellite Studies (CIMSS), initially via a NASA REASoN project, and primarily through ESIP Education initiatives. CIMSS stays active in ESIP for networking opportunities and dissemination opportunities for CIMSS educational tools and resources. Figure 1: Global Satellite & Surface Temperature Montage (updated every six hours). The global montage is created using satellite data, sea surface temperatures and observed land temperatures. For more information, read the overview.